I have many side projects that turned into my main projects. There is the hashtag I created [February 2017] on Twitter, #DisabledAndCute, that has brought me amazing opportunities and has since then grown into a larger initiative. There’s also my creative work outside of journalism: I write essays, fiction and poetry. After these things take off or are well-received, they join the everyday work I do. My planner is my best friend. Without it, I’d get nothing done. I block my days out with time-specific tasks. In the morning, it’s articles and interviews for Cliché Magazine where I am an entertainment writer. In the afternoon, I write essays about blackness, disability and life at various identity intersections. On the weekends, I give my time to fiction and poetry. Because they are fun and it’s important to express yourself in multiple ways through various forms. I think if you can manage to have a little something extra, it’ll make the daily work better—it’ll reinvigorate you. 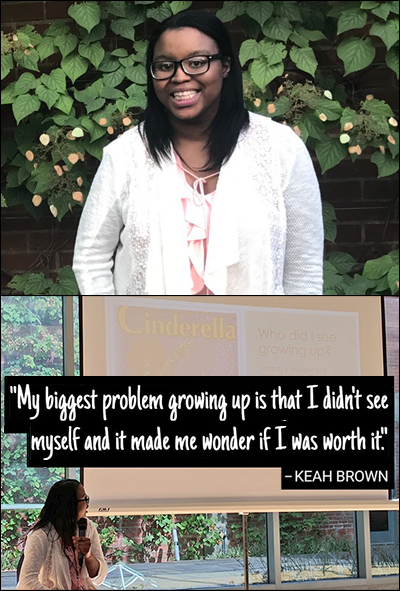 Diptych courtesy of Keah Brown with bottom photograph by Sarah Fathallah of Brown’s presentation “A Journey to #DisabledAndCute: On Representation, a Movement and What's Next” during the annual Affect Conference in 2017.